Thank you for bearing with me the last few days. 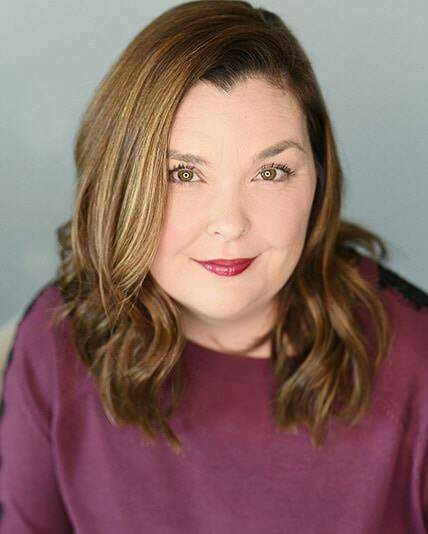 Between the craziness over at The Creative Mama, (good crazy, the Creative Photographer Series has been fabulous this year! ), and my website going down, it has been a crazy week. Thankfully, everything worked out, and as you can see, I am back in business. Not without some little glitches here and there, damage to my nerves, and having to cut ties with my long time hosting company. I learned a thing or two about customer service that is for sure. Back to the food. This salad is probably my favorite thing that I have made all summer. I had no idea when the idea came into my head that this salad would be even a fraction of the amazing that it is. 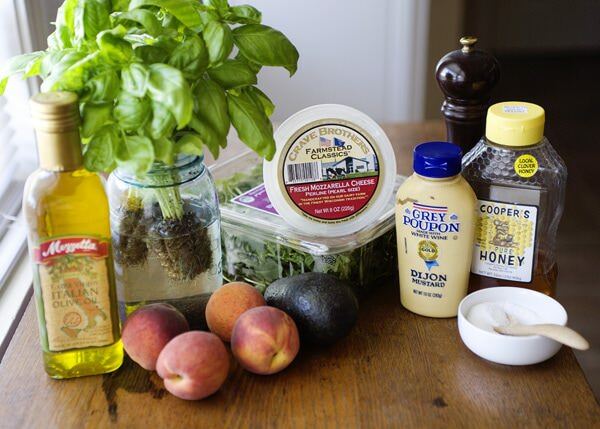 Baby mozzarella, grilled avocados, and grilled peaches, with lots of fresh herbs. I had every intention of adding some grilled chicken, but I forgot all about it, I was eating this salad out of the bowl over the kitchen sink. I love the bites of basil and parsley, they pop in your mouth. I love using fresh herbs as a salad green. It just adds such a brightness that cuts the bitterness of the arugula. I had never grilled an avocado before, but I love what the grill does not only to the color, but it adds a touch of smokiness that is just perfect with everything else going on in this salad. Whisk together the Dijon, honey, garlic, salt, and pepper. Stream in the olive oil while whisking. Set aside. 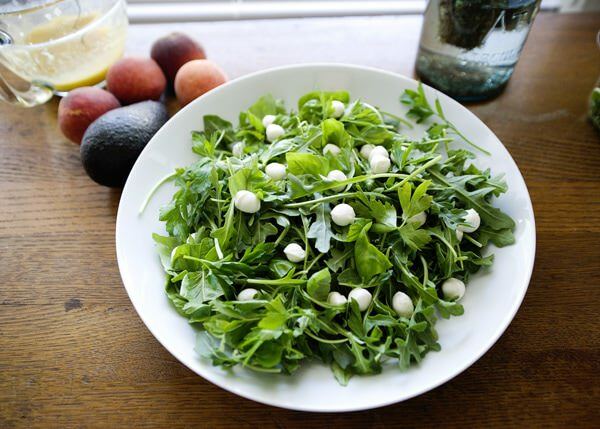 In a large bowl, toss together the baby arugula, basil leaves, and parsley. Add the baby mozzarella. Put in the fridge. Preheat your grill to medium heat. Slice the peaches and remove the pit. Slice the avocado and brush both with olive oil. Season well with salt and pepper. 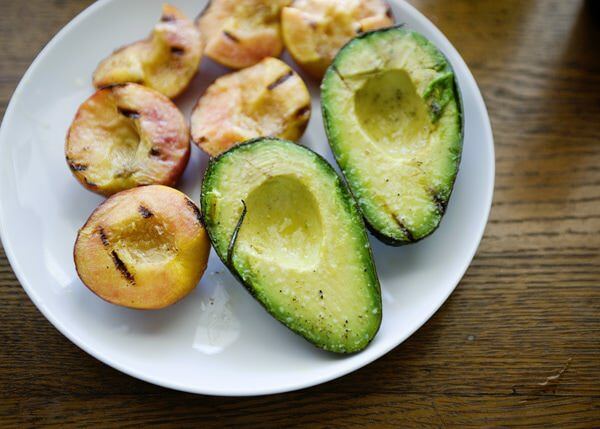 Place the peaches and the avocados slice side down on the grill. Grill for a few minutes, you want some grill lines on the fruit. but you do not want them to turn to mush. Take the fruit off of the grill. Look how gorgeous the heat from the grill made the avocado. I want to eat this again right now. 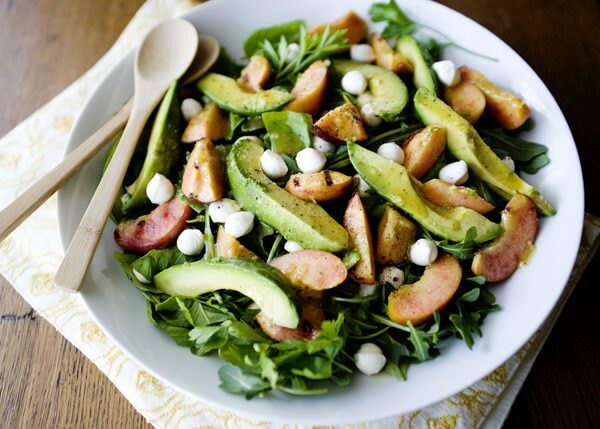 Slice the peaches and avocado and add to the salad bowl. Drizzle the dressing over. Toss lightly. Season with salt and pepper. 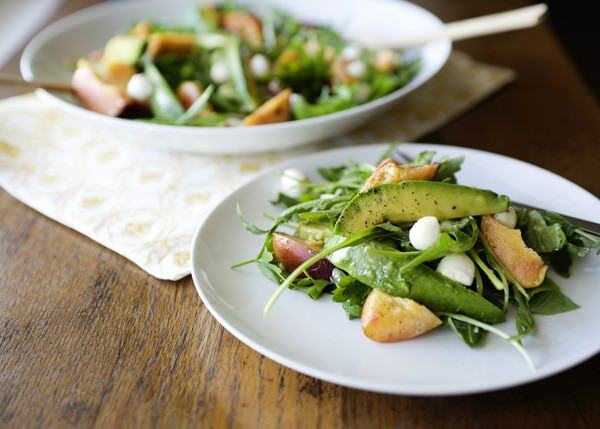 I love summer salads– what a perfect way to enjoy peaches and avocado. Thanks for the inspiration! This sounds great! I recently got some Himalayan pink salt and organic peppercorns from Sustainable Sourcing https://secure.sustainablesourcing.com and I’ll have to try them out in this recipe. 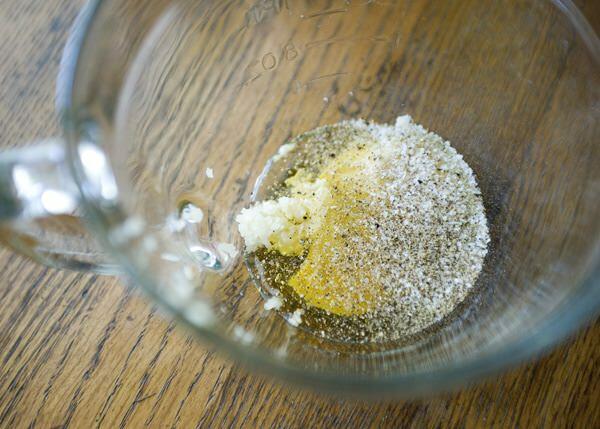 You have to try this really good salt on a recipe like this…it REALLY makes a difference! Thanks for sharing! You are right, it needs good salt and olive oil. humm… looks good!! fantastic recipe! thank you! It is fresh and delicious. I adore avocados and am always looking for new ways to enjoy them. This looks yummy and I’ll be trying it soon! I made this again last night. I love spreading the avocado on wheat toast with a sprinkle of toast. Yum. This looks fantastic! I must try this tonight. I was going to make a cobbler with my peaches but this salad looks too good not to try. I’m going to have sweet dreams tonight! I plan to make this tomorrow, but I want it right now – ha! Thank you for the wonderful idea. Yum. you are welcome Ann, I have made this salad so many times this summer. Love it. 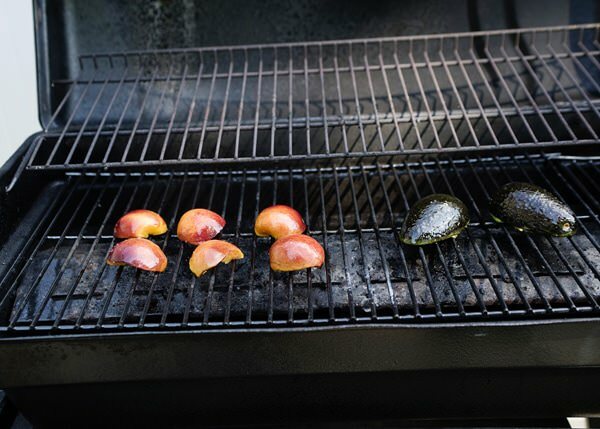 We’ve been obsessed with grilling peaches and avocadoes lately! Usually we put the peaches towards some kind of dessert and the avocadoes on dinner, but I never thought to combine them into a salad! YUM! I just returned from a beach vacation with some extended family–moms, grandmothers, and kids only! We each took a night and cooked dinner and I made this salad to accompany my mussels dinner–everyone RAVED about this salad!! Everyone asked for the recipe–I am sure they will all become big fans on the blog too! My husband attempted grilling avocados without much success so we’ll have to give this recipe a spin. 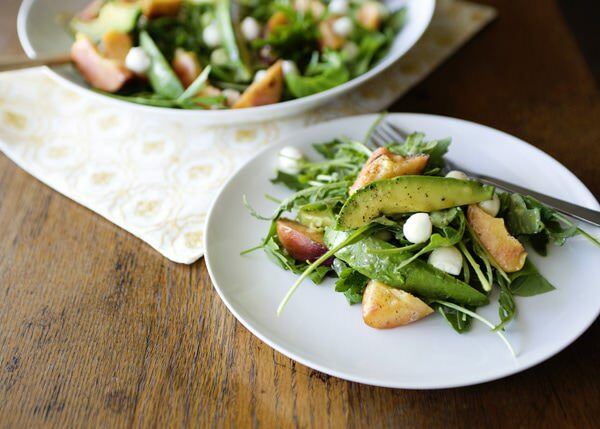 Love the combo of sweet, carmelized peaches with the avo and spicy arugula. Do not leave them on very long. Just enough to get some grill marks. We made this tonight with fish, it was amazing!!!! Ohh.. fish with this salad sounds so good. And healthy! Lots of Omega-3s for you. You mentioned grilled, but do you have a favour for gas grill or not? I love a charcoal grill, but for convenience sake, I use gas. Such a fun combo of flavors here Bree! 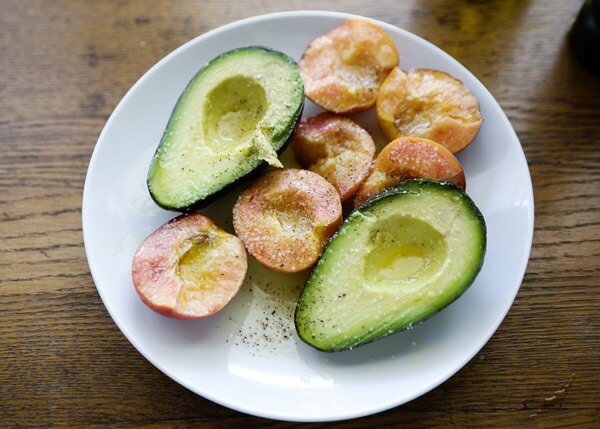 Love the avocado/peach pairing! Thanks Marla! I love this salad. It made me fall in love with avocados. This dressing needs less oil. Come on 1/2 a cup is way too much. To each his own, by all means cut it down if you like. Glad that you liked it Hannah! looks delicious!! fantastic recipe, i will try! 😉 Thanks! Is there an alternative to peach that would go well with the ingredients here? Any stone fruit that you like. Mango would be great too. 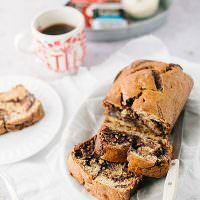 Thanks for share the recipe!